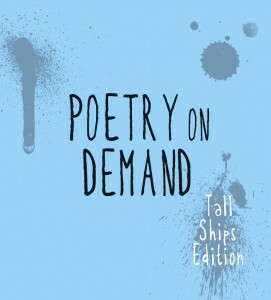 This collection of Poetry on Demand is poetry written at the Tall Ships Festival at Windsor’s riverfront the summer of 2013. With the help of my dear editor Meghan D, and the continued front cover design by Kate Hargreaves, we’re happy to present Poetry On Demand Volume 3! This book was self-published at the Windsor Public Library (Central) in the Xpress Self-Publishing Lab.